I never used to write much about genetically modified organisms (GMOs) before. I still don’t do it that often. For whatever reason, it just hasn’t been on my radar very much. That seems to be changing, however. It’s not because I went seeking this issue out (although I must admit that I first became interested in genetic engineering when I was in junior high and read a TIME Magazine cover article about it back in the 1970s), but rather because in my reading I keep seeing it more and more in the context of anti-GMO activists using bad science and bad reasoning to justify a campaign to demonize GMOs. Now, I don’t have a dog in this hunt (Forgive me, I have no idea why I like that expression, given that I don’t hunt.) I really don’t. I was, not too long ago, fairly agnostic on the issue of GMOs and their safety, although, truth be told, because I have PhD in a biomedical science and because my lab work has involved molecular biology and genetics since I was a graduate student in the early 1990s. I found the claims of horrific harm attributable to GMOs not particularly convincing, but hadn’t bothered to take that deep a look into them. It was not unlike my attitudes towards the the claims that cell phones cause cancer a few years ago, before I started finding dubious studies and looking into them and noted despite the utter lack of a remotely plausible mechanism and uniformly negative studies except for a group in Sweden with a definite ax to grind on the issue. None of this stops activists from likening cell phone companies to tobacco companies, the way antivaccine loons liken vaccine manufacturers to tobacco companies. Back then, I realized that there wasn’t really a plausible mechanism by which radio waves from cell phones could cause cancer in that the classic mechanisms by which ionizing radiation can break DNA molecular bonds and cause mutations don’t apply, but I didn’t rule out a tiny possibility that there might be an as yet unappreciated mechanism by which long term exposure to radio waves might contribute to cancer. As was the case for the nonexistent cell phone-cancer link, there has now been a steady drip-drip-drip of bad studies touted by anti-GMO activists as “evidence” that GMOs are the work of Satan that will corrupt or kill us all (and make us fat, to boot). Not too long ago, I came across one such study, a truly execrable excuse for science by Gilles-Eric Séralini at the University of Caen purporting to claim that Roundup-resistant genetically modified maize can cause horrific tumors in rats. I looked at the methods and conclusions and what I found was some of the worst science I had ever seen, every bit as bad as the quack “science” used by the antivaccine movement, as anti-GMO activists worry about GMOs sapping and impurifying their precious bodily fluids. Then, not too long ago, I discovered a truly quacktastic bit of fear mongering by Jack Heinemann about GMOs in which, or so it is claimed, GMOs produce silencing RNAs that not only survive transit through the gut, get into the bloodstream and thence into cells to inhibit the expression of specific genes, and even get passed down to the next generation to kill your children. That’s right. To Judy Carman, siRNA from GMOs has the potential to kill your future children before they turn five! But back to Carman’s most recent study. As described by Mike Adams, it sounds pretty damning, doesn’t it? It sounds truly horrific, just as the Séralini study did. Adams is useful in that he takes the messages of anti-GMO activists (well, actually, he takes the messages of just about all cranks and quacks) and, as they said in This Is Spinal Tap, turns them up to 11. On the surface, it does, anyway. But what about the actual study. There was really only one thing for me to do, and that’s the same thing I did with the Séralini study: Go and see for myself. So I did. Judy Carman’s study was, fortunately, published in an open access journal, and there was a direct link to the study itself. The first thing I did was to look at the journal. I had never heard of it before. The journal seems to cater to the organic crowd, being sponsored by groups like the Organic Federation of Australia and CSAFE, while the guidelines for authors state that “topics are to be consistent with current principles of organic farming and its associated industries, especially those in Australia, New Zealand, Asia, and the Pacific Islands.” The journal itself appears not to be indexed on PubMed, which tends to indicate either that it’s a new journal or not a very good journal. On the other hand, to be fair, there are plenty of CAM journals indexed in PubMed, and many of them are pure pseudoscience; so I can no longer conclude that lack of indexing in PubMed automatically means a journal is dodgy. It is, however, often an indications that it is. Moreover, if you wander over to Judy Carman’s website, gmojudycarman.org, you’ll see that it’s chock full of anti-GMO activism. Here’s a hint: It’s none of the above. What I found particularly suspicious was Table 3. Notice how the level of inflammation is divided into no inflammation, mild inflammation, moderate inflammation, severe inflammation, erosions, pin-point ulcers, frank ulcers, and bleeding ulcers. This is not really a standard way of scoring inflammation. I don’t know about pigs, but in humans there are a variety of scoring systems for the endoscopic assessment of inflammation (for example, this one), particularly chronic gastritis (which is what we’re talking about, although such redness as described would, if associated with gastritis, be more associated with acute gastritis). 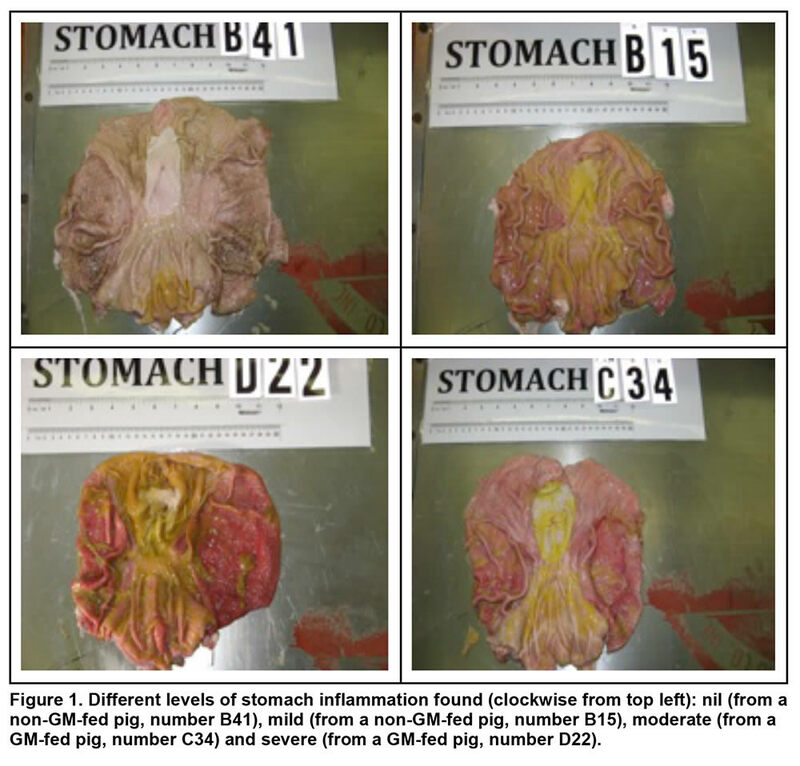 Worse, gross visual assessment of gastric mucosa is subject to high inter-observer variability, and, although the personnel caring for the pigs and doing the autopsies were blinded to the experimental group (which is good), I don’t see any attempt to control for inter-observer variability, and, again, no control for multiple comparisons. I also note that the difference between pin-point ulcers, frank ulcers, and bleeding ulcers is rather arbitrarily defined and not entirely clear. Also notice how twice as many pigs had no inflammation in the non-GMO group and that there was actually a lower risk of mild and moderate inflammation, as well as erosions and pin-point ulcers. Of course, the p-values are all non-significant, except for one: that for severe inflammation. In fact, on the entire table, the only “statistically significant” result is for “severe inflammation.” In fact, as Mark Lynas points out, many more pigs fed non-GMO feed had stomach inflammation than those with GMO feed. There’s another aspect of this paper that’s very troubling, and that these animals were all very sick. Indeed, I have to wonder how they were being cared for. Over half the animals are reported in Table 3 to have pneumonia, defined as “consolidating bronchopneumonia of the cranial ventral lung lobe(s) and/or caudal lobes.” That is just not normal, and it doesn’t sound like a minor pneumonia. True, this pneumonia wasn’t histologically verified, either, as far as I can tell, although pneumonia can be viewed grossly if it’s bad enough. It is, after all, basically puss mixed with mucous in the alveolae and bronchial passages. As has been pointed out in multiple discussions of this study, such a high percentage of animals with pneumonia is an indicator of very bad animal husbandry, indeed. The bottom line is that there are many, many problems with this study, the totality of which are more than enough to render its results meaningless. There is no dose-dependent mechanism for the effects reported, no rhyme or reason consistent with a mechanism that would explain why GMOs would affect just the stomach (and then only to cause severe inflammation) and and uterus size. The study was a fishing expedition and not hypothesis-driven. It’s not surprising that it found something. I’d be shocked if it hadn’t. In the end, this study abused a fairly large number of innocent pigs to produce no useful data. She might try to defend it against criticism, but she basically fails. In particular, one notes that she can’t seem to defend against the charge of a lack of hypothesis and that she didn’t even try to defend the criticism that she didn’t bother to look at stomach histology to verify that there really was inflammation in the gastric mucosa, despite Carman’s touting that the “authors have over 60 years of combined experience and expertise in medicine, animal husbandry, animal nutrition, animal health, veterinary science, biochemistry, toxicology, medical research, histology, risk assessment, epidemiology and statistics.” Sad that they didn’t use all that experience to produce a paper whose results are believable and useful. “[friend], there’s some serious bias here. This was an attempt to reproduce the rat study, but remove the feeding problem, and thus prove the point. Unfortunately, the results really don’t prove out. The problems don’t end there. The abstract tries to point a finger claiming only damages caused by GMOs, but it ignores the full results of the study. First, take a look at the “dramatic” differences in weight of the ovaries. 0.0040 – 0.019 for non-GMO vs. The only reason that there’s such a difference in weight is that they opted to comment on the tiniest of the organs tested. Had they volunteered information about the Standard Deviation, you would have seen that the overall mean weight for the ovaries of the tested groups was equal! Then we can talk about the “bloated stomachs”. What these researchers failed to note is that for the hearts, livers, and spleens – abnormalities were seen in MORE non-GMO than GMO pigs. (This result was not acknowledged in their abstract – even though other results were stated.) Even in the stomachs, more erosion and more moderate inflammation was noted in non-GMO. Here’s the “Occupy Monsanto” link that provided his original source. I followed it to find the study results, and it provided the source link I used. The reason I kept my discussion so short (believe me, I saw other problems) was that I was responding in a Facebook comment thread! Fortunately, the post was received well, and all information about the study – including the flaws – was left available on my friend’s page. Individual weights were recorded weekly and animals were monitored daily by observers who were blinded to a pig’s dietary group. Typically the Mike Adamses and anti-GM shouters of the world trumpet conflicts of interest in science, real and imaginary (at least when they disagree with what’s found), but they are curiously silent about the huge conflict of interest inherent in the pig inflammation study. I am a pathologist. It is true that, in the best of hands, gross examination will be wrong about 30% of the time. You all can figure out what happens when gross examination is not in the best of hands. That’s why we spend so much time looking at slides. Looking at the gross images from that paper raises a number of issues for me. First of all, I think that I can produce similar appearances by manipulating fixation artifact. From what I can tell of the material and methods presented in the paper, the examination by the veterinarians was done fresh, but were the pictures taken fresh? There seems to be fresh blood on the examination table in the photos, which by itself is an indication of sloppiness (it’s not that difficult to spend an extra 10 seconds cleaning up the table so your pictures are presentable), but the paper doesn’t really say what was done. Formalin will take much of the color out of the tissue, leaving an appearance much like that in the top left (nil) image. I find it hard to draw any conclusions here without seeing the full resolution images, but I am suspicious that we are being manipulated. The images in the PDF are low resolution, so it is really hard to tell what the stomachs really look like. I think I should be able to tell a fixed stomach from a fresh stomach, but it’s really hard to do so here. In my (limited) experience, telling people who are against GMOs that the studies they cite are faulty is every bit as effective as telling alties that the studies they cite are faulty. They assume bias because they assume a war — a battle between different ways of thinking and being. On one side you’ve got the Good Guys who care about living with Nature, harmony, and love. On the other side you have the Bad Guys who care about acquiring Power, money, and control. You don’t have to know any science to realize it’s just common sense that the second group can’t be trusted. Science on one side cancels out the science on the other and puts everyone on even footing. So forget the actual details of the issue: choose your side. Make a decision for the kind of person you want to be. I probably don’t need to add that in my (limited) experience the anti-GMOs and the alternative medicine proponents happen to be the same group. And they are very, very emotionally attached to the spiritual implications of the Naturalistic Fallacy. They think I am going along with the Bad Guys because I’m the sort of person who decided to be an atheist and thus it’s ultimately my core values which are screwed up. They honestly can’t tell the difference between good science and bad … so they go with what they’re comfortable with. GMOs often are involved with pesticide use- which is already taboo to organic food producers/ users. These manipulations and torture of ‘natural medicines’ ( i.e. vegetables and fruits) resemble the horrors that vaccines have wrought upon innocent children – and the research cited in support is just as awful. ( @ Gary Null’s You Tube channel) you may view his entire documentaries, ” Seeds of Death”** and “GMOs: Ticking TIme Bombs” which incorporate the wisdom of Mike Adams, Jeffery Smith, RIma, Laibow, Dr Mercola and many other well-known rabble rousers whose careers rely upon the myth that “natural is better”. No COIs here we’re told. ** I’ve actually viewed the entire claptrap fiesta- what I do for scepticism. I’m sympathetic to the view that Monsanto is a Giant Evil Corporation–I’d include them on my list of Top Ten Evil Corporations myself. But that’s more because of how Monsanto tries to control the supply chain: making farmers buy seeds from them, rather than planting seeds from previous crops as has been done since humans invented agriculture. In at least one case, Monsanto successfully sued a farmer for growing one of their products from seeds that had blown onto his property. The GMO strain(s) we have heard the most about are the Roundup Ready products, in which the inserted gene(s) allow the crop to survive spraying with the weed killer Roundup (conveniently, a Monsanto product). This is basically a biological arms race, in that the weeds will eventually (either by natural selection or cross-species genetic transfer) develop resistance to Roundup. But there isn’t any evidence that the crop itself (as opposed to pesticide residues) is harmful to people. And I don’t think Monsanto is intentionally trying to harm consumers’ health (at least directly), because that would be bad for business. This is inaccurate. The farmer was sued for replanting seeds that he knew (because there is record of him getting them tested) came from Monsanto. If he had simply harvested the grain that grew from the seed that allegedly blew onto his property and sold it on the market, he would have faced no penalty. It’s the fact that he knowingly replanted GMO seed that brought the lawsuit. What I’d like to see Monsanto do is have a replanting option in their licensing scheme. This would work as follows: for the standard price, you get to buy seed, but can’t replant it after harvest. For a higher price, you get to replant seed, but the license covers the acreage per year you can replant. This could even be split into a multi-year license and an indefinite license. This is the same arguments from vaccines just with the words GMO instead. In the words of another man who explained it very well “for centuries people kept going ‘My crops keep being destroyed by bugs, Help us Science!’ and ‘my crops struggle to survive drought, help us science’ and science did and suddenly they all turned around and went ‘YOU MONSTERS. You altered life and put chemicals on our crops! '” The whole reason there is GMO is because people wanted and it is beneficial in the first place. If they didn’t no one would have invested in it and we would not be here today. I have said this before, but if anyone really wants to see the difference between “pure” corn and modern hybrids, go to the 19th century farm at Greenfield Village near Detroit and look at their cornfield. There’s no consistency in stalk height, ear size, or row yield (I’m not a farmer so this is possibly not the correct agricultural description). As W. Kevin Vicklund pointed out, it isn’t true that any farmers who have accidentally grown their GM seeds have been prosecuted – it’s a myth spread by anti-GMOers. all the cases I have seen have been where farmers have quite deliberately and knowingly grown their seeds. As for Roundup Ready crops, I don’t see how these make it more likely that weeds will develop resistance and more than they do to regular, and very much more toxic, weedkillers. Glyphosate has remarkably low toxicity – the detergent they add to it is more toxic, which I think is pretty good, when you compare it to earlier weedkillers. About the “pneumonia” that the pigs had. I would bet money that all they were seeing was blood pooling the lungs from the slaughter process. Not everyone may want to hear about this, so quit reading if you are squeamish. When pigs are slaughtered, first they are stunned, usually with a mechanical stunner applied to the head, carbon dioxide, or an electrical stunner. Then they are shackled by the rear legs and raised off the floor, and their carotid arteries and jugular veins are severed. So, at slaughter, blood in their lungs would be cranial. Unless they actually saw pus in the lungs, they can’t diagnose pneumonia. Oh, and BTW, slaughter weight for most pigs is 220 pounds, about 4-6 months of age. And, as a vet with a PhD in pathology, no, you can’t diagnose inflammation on gross exam. In fact, the first stomach from the non-GMO feed looks more anemic than non-inflamed to me. Iron deficient anemia is pretty common in young pigs, so much so that most piglets get an iron injection right after birth. And the alleged differences in how the two groups of pigs behaved–most likely handling differences, from the blinded (HAH!) animal workers. A number of years ago, I recall (from memory, so grain o’ salt) reading about this problem occurring in Canada. A resistant variety of flax was developed, but it cross-polinated with some wild plants that were closely related, resulting in resistant weeds. I forget the details, but that’s the gist of it. Oh, I understand why their licensing is the way it is, and agree there’s nothing illegal about it. I was merely expressing a preference. Second, the reddish area in the lower right, that I assume you’re calling blood, looks more like an upside down logo to me. In particular, the upper left image appears to show some lettering, including the word “INC”. It also looks to me like they have covered the table, and probably also the labels and scales, with plastic wrap prior to placing & photographing each stomach. So I think your concerns about those particular issues can probably be discounted. That is NOT meant to suggest that I think this study is sound – I don’t. Sounds like both groups were equally healthy to me, which makes the claims of “inflammation” on the gross examination rather suspect. If red = inflammation, then I guess my arteries are just full o’ that stuff…. Frankly, if they blinded the veterinarians for the purposes of this one study, that is cruel and certainly detrimental to the veterinarians’ continued livelihood. We hear reports of GMOs leading to pesticide-resistant insects and weeds, yet some say gene technology may be a solution to world hunger via drought resistant plants. In the news we see things about the demise of the honey bees and we hear that Monsanto’s chemicals are responsible. We, ourselves or our families or friends have increased food allergies and poor health. The U.S. government has established a rigorous approval process for biotech products that includes the Food and Drug Administration, the Environmental Protection Agency and the U.S. Department of Agriculture. Moreover, since the first biotech crop hit the market in 1996, about 1 billion acres of U.S. farmland have been planted to biotech crops and trillions of pounds of U.S. soybeans and corn have been consumed worldwide, all with no credible reports of harm to human health. However, the EU won’t grow GM foods and there is suspicious secrecy around the food industry that makes consumers mistrust this process. Furthermore, it is difficult to know who to trust when many, many of the former employees of agribusiness are now in our U.S. government and agribusiness are major contributors to our governments political processes. There are many problems with GMOs and it isn’t just the scientific research. We really need some transparency in reporting, we need some honesty from our government, and we need some accountability from agribusiness. In the research to date, I don’t see replication and I don’t see peer review. Replication involves the process of repeating a study using the same methods, different subjects, and different experimenters. It can also involve applying the theory to new situations in an attempt to determine the generalizability to different situations. Replication, therefore, is important for a number of reasons, including (1) assurance that results are valid and reliable; (2) determination of generalizability or the role of extraneous variables; (3) application of results to real world situations; and (4) inspiration of new research combining previous findings from related studies. It seems that we are just at the beginning of understanding the full implications of GMOs and all the spin that has been happening in order to confuse and confound. I don’t think we need to fight with each other, I think we need to work alongside each other to figure out what is safe and what is not so we can protect our planet and the abundance of human life. I do find it odd that opponents of GMOs seem to be so determined to lay health risks to consumers at the door of GMO products. I suppose it’s because this plays better with the twitchy anti-science section of the population. We’re talking about Bowman? What he did was buy silo seed, spray the plants with Roundup, and harvest the seed from the survivors. Not to defend the folks at Monsanto (who I’m sure are motivated by self interest like many of us) but why would someone willing accept labeling requirements that a) you know will drive off some of your customers, b) will cost you a substantial amount of money to implement; and c) will be the source of unending lawsuits when someone detects (real or imagined) that what is labelled one thing contains something else? Particularly when that product is sold in bulk and mixed and re-portioned at various times before getting to the consumer? Particularly if some stock person at the local store can mess it up? It’s not really that odd…mandated labeling would hurt Monsanto financially, as many uninformed consumers would be turned off simply by the sight of a GMO label. That’s why I disagree with the pro-labeling side of things…why should Monsanto have to incur financial penalties because of the public’s unfounded fears? Imagine there’s a new movement out there that claims that only plants grown from seeds sown between 1 and 3PM are suitable for consumption, and all other plants are unsafe. Should corporations be required to label products with the time of day they were grown? What if this movement included millions of people? The point is that for mandated labeling laws, you need to have evidence that the labeling is appropriate and useful. There’s no evidence that a GMO label would do anything but continue to sow fear in an already undereducated public. I don’t want to ban GMO at this time―just Label it on food. Sure there’ll be some that avoid it, so what, if it’s safe, the stigma will fade, and scaremongers will soon be laughed at. If it’s not harmful, as some $cientists claim, it’ll all work out in the end. His worker, in his evidence in the court case, states that Percy Schmeiser had him spary “a good 3 acres of canola” with Roundup, harvest it separately and store it separately. This seed was then used to plant the next year. I’m kind of p!ssed about anti-GMO propaganda, as I swallowed a lot of it without much thought, and was only disabused of my misconceptions by some comments here, as I recall. Though my sympathies have always tended towards environmentalism, I don’t like being lied to by anyone, and I’m always annoyed (mostly with myself) when I am fooled by misinformation. The knee-jerk anti-technology tendencies I often see among those concerned about the environment both worry and scare me. I’m a technophile, and I like to think that technology will be the answer to a lot of the problems humans face, as insurmountable as they may seem right now. Funny thing, that’s how I got my new wide-screen TV. Why is this necessarily true? In fact, I think it’s likely the opposite. Just look at what happened to MSG. Regarding the Monsanto farmers- wasn’ t the problem that the judge in one case agreed the farmer took the seeds deliberately but seemed to rule that even if the seeds blew onto the farm accidentally, Monsanto could sue the farmer? Orac’s post is just another example of the horrible arguments in favor of GMOs. Anti-vaxxers are kooks, therefore let’s lump the anti-GMOs in with them and take a couple examples of bad science (ignoring the bad science from the GMO crowd), and voila, anti-gmo folks are debunked. This post was very specifically about some bad science that was published and pointed out why it was bad. Orac didn’t state or imply that evolution was bad or that all statements made by anti-GMO people are wrong. What is your scientific field Doug? Are you trained to read studies? Please provide us some citations to high-quality studies and we’ll all have a look. But I imagine you’re a drive-by, your high-dudgeon pearl-clutching is revealing . . .
#12 Shay – if you want to see natural ‘corn’ you need to look at teosinte grass. Any form of corn or maize is an unnatural mutant created by and dependent upon farmers – ears have been selected to the point where they cannot release their seeds naturally and self sow. I looked at the image again, upside down this time, and I still don’t see anything that I recognize as a logo. Logos on autopsy tables are usually on the sides, not on the working surface, where they would make the table hard to clean if they introduced any relief at all. I don’t think that’s a logo even in retrospect, but I would be willing to admit I was wrong if enough people agreed with you. Mike Adams, as a follow-up to the ‘successful’ global protest he rankled about recently ( “March on Monsanto”), now is helping to publicise the “Monsanto Video Revolt” which will commence in a few weeks: people are to make videos with those three words in the title and put them on video sites on the ‘net thus causing HAVOC and CONFUSION and getting media attention. I’m sure the entire world will stand up and take notice and the powers-that-be will quake in their boots**. Yet these same people laugh uproariously at things like Ray Comfort’s display of total ignorance about selective breeding in the “bananas are evidence for creationism” video. It never occurs to them that their own viewpoint is just as biased. drksky – I assumed Dew wanted to avoid confusion with 5cientsts, so put a line through the S. But I cannot be sure. The problem I have is the vagueness about so many anti-GMO complaints. They tend not to be specific about what’s so much worse about doing it deliberately versus the old fashioned approach taking advantage of new traits that form from random mutation (natural or deliberately induced by irradiation). To me, it’s just a matter of increased control, not something fundamentally different. Personally, I like the idea behind GM technology because we can use it to know what’s in our food, rather than blindly trust in the benevolence and subservience of Mother Nature like many anti-GMO people seem to advocate. To me, this mention of a species barrier sounds like Platonism or a declaration of sacred ground via the naturalistic fallacy. Genes are genes. How a new gene gets into the genome doesn’t really matter all that much in how it behaves. Inserting a gene and having the same gene mutate from a spare copy or a “junk” sequence doesn’t affect the result. You’ll have to get more specific about how the insertion of individual genes relates to cloning animals. Nature and breeders are constantly doing the same thing on a random or semi-random basis and no one complains. A link would be nice. Why wouldn’t this also be a risk with conventionally bred plants? What’s so fundamentally different about GM genes once they’re inside the crop’s genome? From what I see so far, the same argument applies for conventionally bred plants as well. The double standard I see is that conventional breeding allowed us to get similar results while being blissfully ignorant of the details. It gets grandfathered in because it’s easier to not think about it. If there’s a problem with a GM crop, I’d think it’d be easier to track down and shut down the dangerous strain. You’re rather casual with that sort of accusation, which doesn’t speak well of your critical thinking abilities or your desire to approach the topic seriously. Myself, I’m just a skeptic/atheist blogger who tries to pay attention to science and pseudoscience. My degree is in spatial science, so if anyone puts a lot of money in my pocket, it’ll be because I drew an informative map. Breaking? “Species barrier”? Human-made abstractions. Nature doesn’t care about our rules. On the other hand drought resistance or better yields with less fertilizer and less water could have huge positive impacts in the areas of water and energy conservation. So, I guess I am not a GMO bad or GMO good person, but more of a GMO “it depends” person. However, from a practical point of view, I am not surprised that Monsanto would focus on lawsuits rather than education. Generic staple crops need to be sold to the entire population, and people are don’t respond well to education. Besides, a few million bucks pays for a lot of lawyers and long-term court rulings, but it doesn’t pay for much temporary TV time. Right or wrong, their approach makes sense for them. I think Texas has a law about “breaking the species barrier” on a farm, but it doesn’t have anything to do with farming. No, we are talking about Percy Schmeiser. He is the origin of a lot of the “sued because Monsanto seeds blew onto your property” claims. In both cases, it seems obvious that the people being sued knew what they were doing, and did so because they wanted to use Monsanto’s product without paying for it. They consciously challenged the licensing system and lost. They were not victims of circumstance. I have a lot of sympathy for their legal arguments, and I am not sure if the courts are correct in rejecting patent exhaustion (essentially ruling that 2nd-generation seeds are not inherently part of the intended use for which the 1st-generation planting was licensed). It seems to me that Monsanto would have to engineer seeds which don’t produce a 2nd generation with so little help. Let’s see now. The standard plasmid cloning vectors typically contain an ampicillin resistance gene, and some are also designed to carry a neomycin resistance gene. The amp resistance marker allows us to select for plasmid uptake into the bacteria, and the neomycin resistance marker allows us to select for mammalian cells that have received a dose of the plasmid DNA. There are also a few plasmids engineered to have kanamycin resistance. None of this has anything to do with the evolution of multiple antibiotic resistance in pathogenic bacteria. The control over the use of antibiotic resistance markers in the lab goes back to the Asilomar meeting in the mid 1970s. The discovery of multiple antibiotic resistance in human pathogens came long before then, and long before genetic engineering — in fact, it was a clue that plasmids are passed back and forth routinely among bacteria, and this led to discoveries that ultimately led to the introduction of genetic engineering and cloning. As for all the rest of the discussion about “breaking the species barrier” and so forth, perhaps we ought to remind ourselves that DNA is DNA, and it exists in everything from ancient microbes to modern microbes to all the modern plants and animals. Only a few viruses use RNA as a genetic carrier, and they can only do this because they take advantage of the cells they infect to make DNA as the intermediate. There is no species barrier in terms of the makeup of the genetic material, and we know that our own DNA is the product of lots of mixing and churning. Within this context of DNA getting moved around within our own genomes over the course of evolution, it is also true that the sequences that code for the workhorse proteins that run the cells are themselves very similar from one species to another. One journal not too long ago pointed out that we humans share the genetic information in a banana at about the fifty percent level. That suggests pretty strongly that the organisms that predated the split between plants and animals already carried the modern complement of biochemical pathways to a great extent. What should this mean to the consumer, who is, most of the time, not a practicing molecular biologist? Mostly, we should remind people that the DNA within our cells is derived from our younger cells, going back to the fertilized egg, and that protection of our genomes is something that our cells do aggressively and fairly efficiently. Replication of our DNA occurs via synthetic processes in the cells, and has to happen via the very long chromosomal DNA strands, each one being hundreds of millions of nucleotides long. It’s true that we eat lots of DNA because it’s a component of food. Our digestive systems are built to break down DNA in food into nutritional components which we recycle as biological building blocks. It doesn’t much matter whether that DNA came from a chicken or a tomato, it’s all food to our system. I tend to agree with you, but we have to bear in mind that are very similar hormone levels (BST and IGF1) in milk from untreated and rBST-treated cows, and no significant nutritional differences. The labeling isn’t really very useful unless you want to boycott milk from rBST cows because of the animal welfare issues, which are what concern me. It might be worth mentioning that rBST use reduces the amount of greenhouse gases produced. Personally I refuse to buy milk from dairies that use homeopathy to treat their cows (Yeo Valley in the UK, I’m looking at you). The way that we can eat most other life-forms suggests the same thing. Cloning animals hasn’t much to do with GMOs per se, let alone plant GMOs. The “species barrier” nonsense is still gnawing at me. It stinks of the idea of genetic purity. There is no such thing. I know, and I actually avoided the “no rbst” brands because I thought it was empty marketing. But if its a fact, they should be able to say it. The same goes for “organic”. They should be free to declare adherence to rules which don’t matter. This would certainly explain the wholesale acceptance of AGW by the scientific community at large given that opposition to such only plays into the hands of an industry which utterly dwarfs all of Agriculture, nevermind simply the small piece of agriculture which Monsanto represents (Net revenue of $10-$20Bn p/a isn’t small change to be sure, but other companies in the food chain make much more (ADM net revenue is ~$80Bn) and oil companies, who one might expect have the capacity to actually buy scientists… well… BP has net revenues closer to $300Bn…. No doubt however your explanation is correct. The companies with the least money can buy scientific opinion, those with the most money… well, they’re too busy or something, that probably explains it. It is unfortunate that virtually all safety testing of genetically modified food products focus on acute reactions when intuitively it is the potential for chronic effects that is most concerning. We have millions of years of adaptation and symbiosis with the biosphere, and somehow we think we can create whole new species that could not occur in nature by splicing together segments of completely different species (such as GM salmon or BT corn) and as long as it is cosmetically acceptable and doesn’t kill someone the moment they touch it assume it is safe. In my opinion any particular transgenic requires consistent and regular consumption by a study group for at least three generations before it should be allowed to market. However the health concerns aside, genetic modification of food crops and animals is an attempt at masking the inherent problems of our unsustainable agricultural practices, namely synthetic chemical and petroleum energy intensive monoculture. We’re placing plants in a completely alien environment and then wondering why nature is fighting back. We create monocultures, so pests have a feeding frenzy. We plant in rows leaving deserts between them, so nature tries to fill it. We engineer the crops to produce their own pesticides and tolerate being drenched in herbicides, so nature denies us the pollinators we need to grow the crops and produces super weeds to defeat our herbicides. In turn, we start using stronger and stronger herbicides… when will we discover the MRSA of weeds? Perpetual escalation always ends in mutually assured destruction. I personally do my best to avoid genetically modified “foods” however that is relatively easy given I consider the major modified crops – wheat, corn, and soy – to be unsuitable for regular human consumption anyway. In addition, the notion that GMOs will “feed the starving people of the world,” is an obfuscation of the real problem – there are too many people. What is the basis for your concern about chronic exposure? How are inserted genes significantly different from those that form from natural mutations and modifications brought about by conventional breeding? These plants we call “crops” were already quite unnatural before we started tinkering with genes in a more direct manner. They would have never developed in nature without human effort and couldn’t survive or reproduce on their own. What about chronic health concerns about new cultivars brought about by conventional breeding and natural mutation? What’s all this holier-than-thou talk about natural species versus artificial species? Genes are genes. They are what they are, regardless of their origin. It’s also kind of creepy, since it’s sounds like you believe in a concept of genetic purity. No. Such. Thing. Genetic modification and monocultures are two entirely different concepts. We know monocultures are a problem. So – let ’em starve? One of Orac’s problems is that he is fully aware of the truth & the science, but knowingly spouts lies & deceptions anyway. He has violated every tenet that should guide scientific inquiry & commentary. His original article, like everything Orac blogs about, lacks independent science references and relies on industry-sponsored “science” or industry-dependent minions (such as Orac) who pander to drug companies or govt regulators to gain materially. Ignoring of course the long term multigenerational studies which are performed and show no chronic effects. Or, y’know, the abject lack of any plausible mechanism by which chronic effects would occur. Perhaps this is semantics, although I feel not (meaningful terminology appears to be something the anti-GM movement cares not one fig about), but these aren’t new species. They are at best (and at a push) new varieties of already extant species. One assumes if 3 generations were used you’d demand 5, or 10, or whatever made it economically non-viable to do GMOs… however given that multigenerational studies have been done, and a recent review of the literature suggests they are not worthwhile and that 90 day studies are sufficient… http://www.sciencedirect.com/science/article/pii/S0278691511006399 one wonders exactly what foundation other than fantasy your demand for multigenerational studies rests on? Denied pollinators? What on earth are you on about? One assumes you’re perfectly aware that links between GM production and CCD (I assume that is what you’re talkign about in terms of pollinators anyway…) is utterly spurious. Good that you’re taking a break. Posting drivel is so tiring. Michael Polidori is gullible and/or ignorant enough to take vet and naturopath Joel Wallach’s ‘Dead Doctors Don’t Lie’ seriously. This is crankery of a high degree indeed. There’s also the unfortunate incident of a patient under his care dying while being chelated. One can only hope that you’ll continue revolutionizing physics in YouTube comments. At least our version does, for some reason we have been told it is uncommercializable though. Which is odd because I didn’t see anything come up in the allergen hit database. I’m reminded of an urban legend behind Kentucky Fried Chicken’s name change to KFC. One explanation I heard from a KFC spokesperson on TV was that people like initialisms and acronyms. Another, more likely, one I’ve heard is that they wanted to take people’s mind off of “Fried” and the fatty connotation that comes with it. There are a lot of stupid marketing departments out there, as well as marketing departments that assume customers are largely stupid. Of course, the latter tend to be right a lot of the time. There is a similar legend about McDonald’s, claiming that they buy their meat from a company called “100% Beef” so they can say their burgers are 100% beef. Precisely. It is a mask. Synthethic chemicals are entirely unnecessary. Bt is a natural bacterium with limited evidence of adverse effect in humans. But the use of Bt is a symptom of an unsustainable practice – monoculture. However Bt transgenics are granted GRAS (Generally Regarded As Safe) status, meaning no further safety testing is called for. Nevermind that Bt transgenics are commonly produced using microprojectile bombardment which is prone to random gene deletion and aberrant mutation. As long as it looks OK, it’s safe, right? You miss the point. Bronze Dog was referring to regular crops, not GM. Selective breeding, which humans have been doing for thousands of years, results in a number of plants that couldn’t survive or reproduce on their own.What mules have to do with it, I don’t know, unless you are suggesting that natural “abominations” cannot reproduce, while human abominations can, which is just silly. Haven’t you heard of horizontal gene transfer? Please tell me you don’t think GM foods are the result of interbreeding different species. Nature doesn’t give a rat’s posterior about the biosphere. A species will expand until something stops it. Humans are part of the biosphere too, you know. Not just rodents, and don’t forget the billions of human meals, without a trace of any adverse effects. It isn’t subjective, there are some minor disagreements, but none of the GMOs we have seen thus far are different species by any definition I have seen. They are far too similar to the species they are based on. Plenty of plants naturally produce toxins of one sort or another to protect themselves, this isn’t unusual. I don’t think Einstein meant that you can make stuff up and insist it’s true without any evidence to support it. You misunderstand. Bt isn’t a mask, it allows you to increase yield without synthetic chemicals. I don’t really follow your point. You know what else is prone to random gene deletion and aberrant mutation? Organic plants, which are exposed to natural background radiation, and natural UV light. An “established environmental toxin and carcinogen”? Citation? Show us some evidence then. Making unsupported claims doesn’t cut it here. You’re the one suggesting we starve people just enough to make them infertile. Since it’s your idea it’s only fair that you should be first in the queue. However, I suspect you are thinking of people of a different color far away where you won’t have to watch them suffer. Which I think is monstrous. APC: If you think choosing to let the world starve (and yes, starving to the point of infertility is starving, and actually probably even crueler than killing them outright since you condemn them quite consciously to a lifetime of pain) is in any way sustainable . . . well. Enjoy the global war you will have created. BTW, people in starvation zones still breed, so I do not think you really understand what you are talking about. Point of fact: many Monsanto seed licenses require planting “refuges” as a percentage of acreage. The refuges are non-GMO crops designed to act as buffers to help prevent evolution of resistance, by giving a place for non-resistant pests to out-compete resistant pests. Looks like I missed APC’s nonsense while I was taking a break from RI. Thanks for doing your part, Kreb. Of course, I’m disgusted with the starvation sentiment as well as the implicit racism and wingnuttery/trollish libertarianism I sense behind it. It’s counter-intuitive, but it seems to me that famine can provide incentives to have more children. Reproductive rates are high in areas of famine in part because the people are essentially trying to ensure there is a next generation by producing higher numbers so some can survive. They also tend to put children to work as farmhands and scroungers, thinking they can get a net increase in food for their family that way. If we can make GMO crops for them that produce higher or more reliable yields with less work, we’ll remove those incentives that lead to population explosions. It’s better than dehumanizing them so you can rationalize trampling on people who are already suffering. @ChrisP -Comment # 83 – a personal attack without explanation or substance. I stand by every fact I posted. Chris doesn’t take the time to cite a single factual error in my post. @Tbruce – #85 – Another factless post abd personal attack. Where’s your evidence? @ Krebiozen – #86 – Wallach has never claimed people in China lived to be 250 years old. In one of his books he mentions a Chinese govt report of Chinese herbalist Li Ching-Yuen living to the age of 256, but it’s anecdotal and not used by Wallach in the plural or as an example of something that can be achieved by any human being. You are seriously defending Wallach? He has made so many ludicrous claims I’m surprised anyone takes him seriously. The oldest living person that has some documentation (I’m sure there is a certain amount of exaggeration in there), was a fellow, a Dr. Li, along the Tibetan Border, and this fellow, when he was 150 years old received a big certificate from the Imperial Chinese Government. He was born in 1677, and 150 years later was given a certificate by the Imperial Chinese Government for being 150. And then when he got to be 200 years, they sent him another, and then 50 years later they sent him another certificate, and supposedly he died at age 256. It’s people of that nature – he’s written up in the New York Times in 1933 when he died, and The London Times, and so this is fairly well documented. But he may have only been 200 years old. I don’t know if he was 256, but this is the person who led James Hilton to write that story. There is no mention of selenium and zinc supplementation being necessary for everyone with cystic fibrosis. Fat soluble vitamins may be important in CF patients because they suffer from pancreatic insufficiency which can reduce absorption of fats and fat-soluble vitamins. Antioxidants may (or may not) reduce the number of lung infections CF patients get, but it won’t change their genome. In 1995 NCAHF received a report from a consumer in California who stated that Wallach was dispensing chelation therapy for coronary artery disease at a clinic in San Francisco. The caller was concerned because her father-in-law had died following Wallach’s care. He had become very weak, but Wallach had poisoned him against returning to his regular physician, so he did not seek medical help. His wife, who is also a disciple of Wallach’s ideas and health care, had the body cremated. This wouldn’t be the first death associated with chelation, which isn’t proven to be useful for anything other than documented heavy metal poisoning. Whining about species barriers comes across as borderline evolution denialism, since evolution means any “species” we label is a moving target. The collective group of organisms that can produce fertile offspring through breeding are the reality. The “species” label is just a human symbol we invented to talk about those collections of organisms. I say slaughter the sacred eidolon cow of Platonism; it makes the best hamburger. Talking about vague risks of new genes misses the whole point why we bring up selectively bred plants, since random mutations can also be dangerous for the same reasons. If you complain about a type of risk, you can’t just demonize one source of it, whitewash another, and expect us to accept the double standard. I don’t buy into Disneyfied views of nature. Talking about monocultures completely misses the topic in question. I wouldn’t be surprised if genetic modification could be used to reverse monoculture trends if harnessed the right way. The technology and how people can use or abuse it are two different things. We’re talking about whether or not there are health risks from eating GM crops, which is a scientific question. How we deal with monocultures seems an unrelated and largely political question to me. Talking about how these plants can’t sustain themselves demonstrates the ignorance of what humankind has been doing to these plants over the millennia. We’ve bred numerous crops that are completely dependent on human care. We did this long before we knew genes existed. I don’t recall hearing anyone complain about food crops growing in the wild as invasive species… You know, a food crop being unable to survive without human care would actually be a good thing if you’re an environmentalist who hates invasive weeds. Cromwell et al. 2002: University of Kentucky and Monsanto Company – USA. On the issue of herbicides and pecticides – like many of the household chemicals we use they are not healthy in the same way that detergent or brake fluid isn’t healthy. But we still use them because of the necessity or the choices we make. However, to think that these chemicals are “safe” is an error. The term safe refers to the correct and intented use in the context of specific paramenters. Does this mean that we must stop using glyphosate? No! But it does mean we should start to think about sustainability, not from a fanatic “green” perspective but thinking about how much chemical pollution our ecosystem (including ourselves) can actually handle. One company rep admitted at a meeting a few years ago that in some areas farmers were spraying up to three times the concentration of glyphosate, than was recommended, because of the development of resistance in weeds. Dave, it’s not the results that determines if it’s bad science, it’s bad methodology. You could have cited those studies without rehearsing your prejudices and throwing up straw men. The only pseudo-science involved in GMOs and their regulation is the phrase “substantially equivalent” which the FDA uses to avoid regulating GMO. Of course this is nonsense as “pest-resistant” GMO corn (one example of MANY) has 2 insecticides in every part of the plant which will kill some insects that normally feed on corn, but chemical insecticides STILL have to be used to kill a wider range of corn pests..
“Round-up Ready” corn is regularly sprayed with herbicide, contaminating every part fo the crop, inside and out, with substances that have never been part of our diets, but are known to kill most plant life. Additional changes occur in the nutritional levels (some are documented), but while companies may be aware of the changes they do not have to report them to the FDA or USDA as all gene altered crops are pre-approved for market based on the nonsensical phrase “substantially equivalent”. Biotech companies can engage the FDA in voluntary consultations… but they are VOLUNTARY. That pharase “substantially equivalent” is so blatant a lie I am surprised, to this day, that it is being used. Conventional corn can be eaten by insects that normally feed on corn. GMO corn will kill some of those same insects… that is not substantially equivalent, from a bug’s-eye view. When we change the DNA of our food with a random insertion of a package of genes (viral bacterial animal and/or human) which causes the plant to divert resources to the creation of toxic proteins we diminish the corn’s nutritional value, increase the growing time to mature harvest and cause changes to the corn that no one can predict & no one is looking for. Arpad Pusztai’s potatoes reveal 2 things. 1, causing potatoes to produce lectin resulted in some rats, being fed the potatoes, to sicken & die, This was alarming and unexpected… UNEXPECTED!!! 2, the reaction of British biotech companies and the British govt was to attack Pusztai’s credibility and abilities as a researcher, even though he is a world renowned and respected geneticist. This is typical corporate tactics & corporate-influenced govt tactics, to ignore safety and health issues in favor of corporate profits… in this case protecting the technology from bad press (the truth) so that ownership of our entire food supply by corporations can proceed… with farmers unable to save seed, paying more for GMO seed and consumers deprived of choice (this includes the destruction of the organic food industry by widespread contamination of the USA food crop. Organic corn and soy are the first 2 victims on USA and Canadian farms. Anyone defending the current horrendous way in which we ignore safety, ignore concerns about nutrition, ignore widespread contamination of conventional & organic crops and ignore the overwhelming majority of informed Americans and Canadians who want GMO labeled… anyone who sides with this betrayal of trust and hijacking of our food supply is ignorant of the facts surrounding this misapplication of biotechnology and/or is working directly or indirectly for the industry. Underutilizing much of our cropland in the world we still produce enough to feed 3 billion more people than we have. We must convert to sustainable farming practices because the alternative is, well how should I put this… unsustainable! Cystic fibrosis is “an autosomal recessive genetic disorder that affects most critically the lungs, and also the pancreas, liver, and intestine. It is characterized by abnormal transport of chloride and sodium across an epithelium, leading to thick, viscous secretions.” (From Wikipedia). I used to help diagnose CF by doing sweat tests, which show abnormally high sodium in sweat, which no amount of selenium will cure. Even on the CFF’s page on antioxidant therapies for CF there is no mention at all of selenium, nor on their page on vitamins and minerals, and on a page about a workshop on antioxidants and CF, which is the “study” you quoted, selenium is mentioned as possibly increasing glutathione levels which might help CF patients. That is a long, long way from curing CF as Wallach claims to be able to do. I never suggested he did. I wrote, “People in China who live for 250 years?” and later amended that to 200 years. Wallach claims there is a documented case of a person in China who lived to 200 years old. I quoted and linked to his own words doing just that. How can you possibly deny this? How is quoting a person’s own words from their own publications and website, “twisting the truth and lying”? I’ll ignore the Godwin, for now. I see you have swallowed the hateful lies and propaganda about Dr. Barrett. How is he disgraced exactly? Can you point to a single piece of inaccurate information on any of Barrett’s websites? I proved you wrong by linking to The National Council Against Health Fraud’s record of a patient who died after being chelated by Dr. Wallach. It’s not third hand, and The National Council Against Health Fraud are a reliable organization. People here can read what you wrote, what I wrote, and they can go to Wallach’s words that I linked to. It is very clear that everything I wrote is accurate, and that it is you who is attempting, extremely ineptly, to twist the truth here. But you aren’t consistent. You demonize the risks of GM crops while deliberately ignoring the exact same risks when they’re a product of natural variation. And natural variations happen all the time without human intervention. It doesn’t help your case that the division between natural and artificial is pretty much arbitrary and stinks of outdated, ideological notions of genetic purity. Oh, and yes, everything is a trade-off. A gene that wards the crop against pests can provide a net increase in nutritional value if it prevents pests from eating the plant and lowering the nutritional value by a greater amount. It’s all about finding better cost/benefit ratios, and those can vary depending on the local environment. I don’t have much to add to the conversation this evening, but I just HAD to comment. I am so glad to have found this blog and read through the comments. An hour and twenty freakin’ minuets of Gary Null?